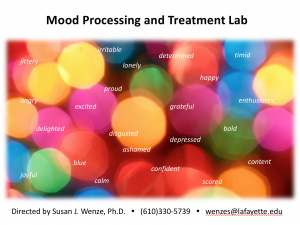 The Mood Processing and Treatment (MPAT) Lab at Lafayette College conducts research on mood disorders and related conditions. Specifically, we study cognitive and emotional processes in individuals with sub-threshold and threshold-level mood and anxiety symptoms. We also conduct research on mental health treatment needs and outcomes for affective disorders, anxiety, stress, and related concerns. As the director of the MPAT Lab, I have the pleasure of working with bright, enthusiastic, and motivated students, who have served as research assistants, EXCEL Scholars, and undergraduate collaborators on my work. My program of research at Lafayette would not be possible without the help of these dedicated individuals. 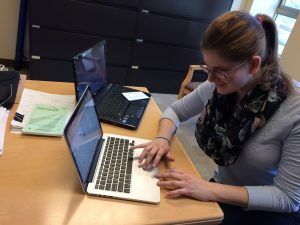 MPAT Lab students help with all stages of my studies, from design and IRB submission, to participant recruitment and tracking, data collection and entry, statistical analyses, and writing up results. 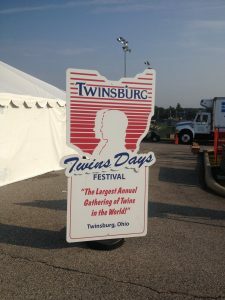 Students have been included as co-authors on published papers and conference presentations, and one even accompanied me to the annual Twins Days Festival in Twinsburg, OH, where we ran nearly 170 participants in 2 days (Wenze & Battle, 2018)! 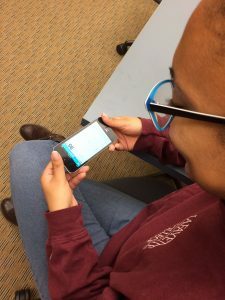 Recent projects include a qualitative study of the mental health treatment needs and preferences – with a focus on receptivity to internet interventions – among new mothers of multiples (Wenze, Miers, & Battle, under revision) and an ecological momentary assessment study of the momentary correlates, antecedents, and consequences of experiential avoidance in individuals with varying levels of depression and anxiety symptoms (Wenze, Gaugler, Sheets, & DeCicco, 2018). 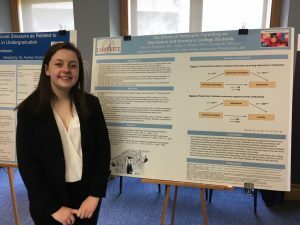 Below you will find a list of students who have worked in the MPAT Lab since I arrived at Lafayette in 2014, as well as some “action shots” of lab staff testing protocols, collecting data, and presenting our work. We are located in room 212I of Lafayette’s Oechsle Hall of Psychology and Neuroscience, and we can be reached at wenzes@lafayette.edu or MPATLab@lafayette.edu.